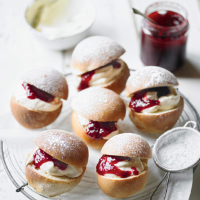 These little buns, split and filled with jam and cream make a great alternative to scones for afternoon tea. If making more than a day in advance, it’s better to freeze them, then thaw and warm through in the oven before serving. 1. Put the flour, salt, sugar and yeast in a large bowl. Add the butter and milk. Mix with a round bladed knife to make a fairly soft dough, adding a dash more hot milk or water if the dough feels dry. Turn out onto a floured surface and knead for 10 minutes to make a smooth, elastic dough. (Alternatively knead for 5 minutes using a free-standing mixer fitted with a dough hook). Place in a lightly greased bowl, cover with cling film and leave in a warm place for about 1 hour or until the dough has doubled in size. 2. Grease a large baking sheet. Punch the dough to deflate it and turn out onto a floured surface. Divide into 12 pieces and shape each into a ball. Space well apart on the baking sheet. Cover loosely with greased cling film and leave for 20 minutes. Preheat the oven to 200°C, gas mark 6. 3. Bake the buns for 10 - 15 minutes until risen and pale golden. Transfer to a wire rack to cool. 4. Make a deep diagonal slit through the top of each bun. Ease open with a knife and fill with the cream and jam. Serve dusted with icing sugar. This recipe was first published in Mon Apr 16 14:52:43 BST 2012.